Some scientists use a broader definition of Hominidae which includes the great apes, and instead call the group I am discussing “hominins”. For a good discussion of the hominid/hominin terminology issue, read this article by Lee Berger. The word “hominid” in this website refers to members of the family of humans, Hominidae, which consists of all species on our side of the last common ancestor of humans and living apes. Hominids are included in the superfamily of all apes, the Hominoidea, the members of which are called hominoids. Although the hominid fossil record is far from complete, and the evidence is often fragmentary, there is enough to give a good outline of the evolutionary history of humans. The time of the split between humans and living apes used to be thought to have occurred 15 to 20 million years ago, or even up to 30 or 40 million years ago. Some apes occurring within that time period, such as Ramapithecus, used to be considered as hominids, and possible ancestors of humans. Later fossil finds indicated that Ramapithecus was more closely related to the orang-utan, and new biochemical evidence indicated that the last common ancestor of hominids and apes occurred between 5 and 10 million years ago, and probably in the lower end of that range (Lewin 1987). Ramapithecus therefore is no longer considered a hominid. The field of science which studies the human fossil record is known as paleoanthropology. It is the intersection of the disciplines of paleontology (the study of ancient lifeforms) and anthropology (the study of humans). This species was named Australopithecus ramidus in September 1994 (White et al. 1994; Wood 1994) from some fragmentary fossils dated at 4.4 million years. A more complete skull and partial skeleton was discovered in late 1994 and based on that fossil, the species was reallocated to the genus Ardipithecus (White et al. 2005). This fossil was extremely fragile, and excavation, restoration and analysis of it took 15 years. It was published in October 2009, and given the nickname ‘Ardi’. Ar. ramidus was about 120 cm (3’11”) tall and weighed about 50 kg (110 lbs). The skull and brain are small, about the size of a chimpanzee. It was bipedal on the ground, though not as well adapted to bipedalism as the australopithecines were, and quadrupedal in the trees. It lived in a woodland environment with patches of forest, indicating that bipedalism did not originate in a savannah environment. A number of fragmentary fossils discovered between 1997 and 2001, and dating from 5.2 to 5.8 million years old, were originally assigned to a new subspecies, Ardipithecus ramidus kadabba (Haile-Selassie 2001), and later to a new species, Ardipithecus kadabba (Haile-Selassie et al. 2004). One of these fossils is a toe bone belonging to a bipedal creature, but is a few hundred thousand years younger than the rest of the fossils and so its identification with kadabba is not as firm as the other fossils. This species was named in August 1995 (Leakey et al. 1995). The material consists of 9 fossils, mostly found in 1994, from Kanapoi in Kenya, and 12 fossils, mostly teeth found in 1988, from Allia Bay in Kenya (Leakey et al. 1995). Anamensis existed between 4.2 and 3.9 million years ago, and has a mixture of primitive features in the skull, and advanced features in the body. The teeth and jaws are very similar to those of older fossil apes. A partial tibia (the larger of the two lower leg bones) is strong evidence of bipedality, and a lower humerus (the upper arm bone) is extremely humanlike. Note that although the skull and skeletal bones are thought to be from the same species, this is not confirmed. A. afarensis existed between 3.9 and 3.0 million years ago. Afarensis had an apelike face with a low forehead, a bony ridge over the eyes, a flat nose, and no chin. They had protruding jaws with large back teeth. Cranial capacity varied from about 375 to 550 cc. The skull is similar to that of a chimpanzee, except for the more humanlike teeth. The canine teeth are much smaller than those of modern apes, but larger and more pointed than those of humans, and shape of the jaw is between the rectangular shape of apes and the parabolic shape of humans. However their pelvis and leg bones far more closely resemble those of modern man, and leave no doubt that they were bipedal (although adapted to walking rather than running (Leakey 1994)). Their bones show that they were physically very strong. Females were substantially smaller than males, a condition known as sexual dimorphism. Height varied between about 107 cm (3’6″) and 152 cm (5’0″). The finger and toe bones are curved and proportionally longer than in humans, but the hands are similar to humans in most other details (Johanson and Edey 1981). Most scientists consider this evidence that afarensis was still partially adapted to climbing in trees, others consider it evolutionary baggage. This species was named in 2001 from a partial skull found in Kenya with an unusual mixture of features (Leakey et al. 2001). It is aged about 3.5 million years old. The size of the skull is similar to A. afarensisand A. africanus, and has a large, flat face and small teeth. A. sediba was discovered at the site of Malapa in South Africa in 2008. Two partial skeletons were found, of a young boy and an adult female, dated between 1.78 and 1.95 million years ago (Berger et al. 2010, Balter 2010). It is claimed by its finders to be transitional between A. africanus and Homo and, because it is more similar to Homo than any other australopithecine, a possible candidate for the ancestor of Homo. A. sediba was bipedal with long arms suitable for climbing, but had a number of humanlike traits in the skull, teeth and pelvis. The boy’s skull has a volume of 420 cc, and both fossils are short, about 130 cm (4’3″). Australopithecus afarensis and africanus, and the other species above, are known as gracile australopithecines, because their skulls and teeth are not as large and strong as those of the following species, which are known as the robust australopithecines. (Gracile means “slender”, and in paleoanthropology is used as an antonym to “robust”.) Despite this, they were still more robust than modern humans. A. boisei existed between 2.1 and 1.1 million years ago. It was similar to robustus, but the face and cheek teeth were even more massive, some molars being up to 2 cm across. The brain size is very similar torobustus, about 530 cc. A few experts consider boisei and robustus to be variants of the same species. H. habilis, “handy man”, was so called because of evidence of tools found with its remains. Habilis existed between 2.4 and 1.5 million years ago. It is very similar to australopithecines in many ways. The face is still primitive, but it projects less than in A. africanus. The back teeth are smaller, but still considerably larger than in modern humans. The average brain size, at 650 cc, is considerably larger than in australopithecines. 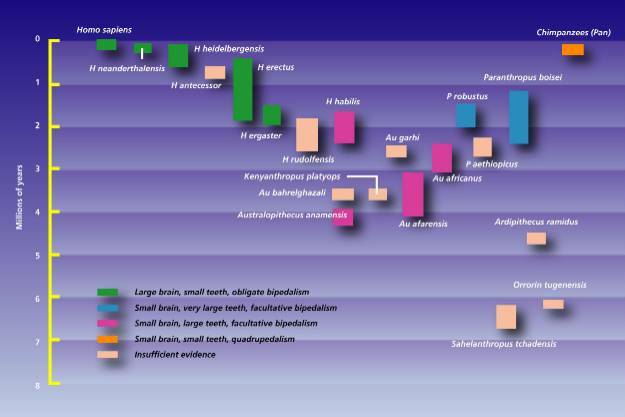 Brain size varies between 500 and 800 cc, overlapping the australopithecines at the low end and H. erectus at the high end. The brain shape is also more humanlike. The bulge of Broca’s area, essential for speech, is visible in one habilis brain cast, and indicates it was possibly capable of rudimentary speech. Habilis is thought to have been about 127 cm (5’0″) tall, and about 45 kg (100 lb) in weight, although females may have been smaller. Habilis has been a controversial species. Originally, some scientists did not accept its validity, believing that all habilis specimens should be assigned to either the australopithecines or Homo erectus. H. habilisis now fully accepted as a species, but it is widely thought that the ‘habilis’ specimens have too wide a range of variation for a single species, and that some of the specimens should be placed in one or more other species. One suggested species which is accepted by many scientists is Homo rudolfensis, which would contain fossils such as ER 1470. Archaic forms of Homo sapiens first appear about 500,000 years ago. The term covers a diverse group of skulls which have features of both Homo erectus and modern humans. The brain size is larger thanerectus and smaller than most modern humans, averaging about 1200 cc, and the skull is more rounded than in erectus. The skeleton and teeth are usually less robust than erectus, but more robust than modern humans. Many still have large brow ridges and receding foreheads and chins. There is no clear dividing line between late erectus and archaic sapiens, and many fossils between 500,000 and 200,000 years ago are difficult to classify as one or the other. Even within the last 100,000 years, the long-term trends towards smaller molars and decreased robustness can be discerned. The face, jaw and teeth of Mesolithic humans (about 10,000 years ago) are about 10% more robust than ours. Upper Paleolithic humans (about 30,000 years ago) are about 20 to 30% more robust than the modern condition in Europe and Asia. These are considered modern humans, although they are sometimes termed “primitive”. Interestingly, some modern humans (aboriginal Australians) have tooth sizes more typical of archaic sapiens. The smallest tooth sizes are found in those areas where food-processing techniques have been used for the longest time. This is a probable example of natural selection which has occurred within the last 10,000 years (Brace 1983).